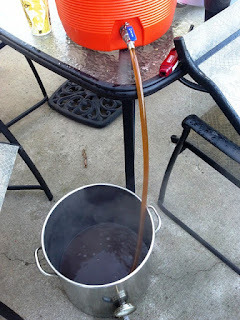 You may remember that a couple weeks ago I asked my blog readers "What should I #HomeBrew Next?" Boo Berry Wheat won the vote, and Eric the Awful came in 2nd. I kegged and bottled the Boo Berry yesterday and today I brewed Eric the Awful. Interestingly enough, I didn't actually close down the poll, and since that time, there have been quite a few votes for Ale to the Chief: Honey Porter. 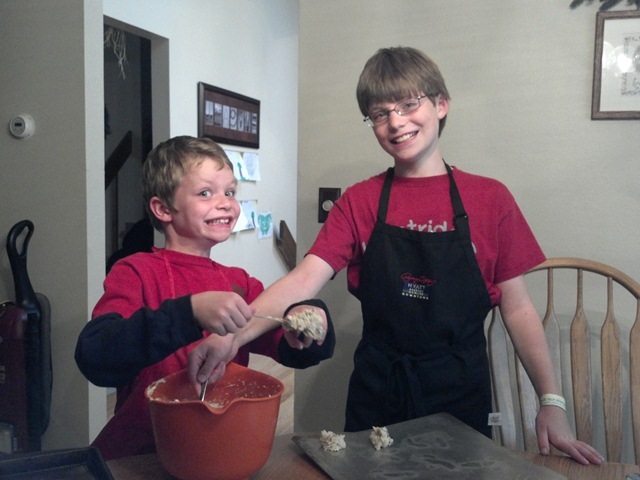 Not really on topic, but my boys made cookies this weekend. My kids and I have a game we play called "Eric the Awful" named after Ray Steven's song (see the video at the end of this post if you are unfamiliar with the song). The kids ride around on their bikes and I chase them. It is even more fun when friends of the boys join in. The game is hard work, but at least everyone gets pretty good exercise. he beer itself is meant to be a combination of SheppyBrew's Eric's Irish Red Ale and my Quarter Life Crisis Hoppy Red Ale. It has the malt bill of Eric's Red with hopping much more like an IPA. Its ABV is lower than QLC. Brew day started early like usual. In fact, it was dark when I started the mash. This time, I had real issues getting the mash to the right temp. I started out too hot. I over-compensated with ice to get too cold. I boiled water to get back into the mid-150's. I'm sure it will turn out fine, but if I have to recreate the mash profile I am in big trouble. My pre-boil gravity was pretty much right on. 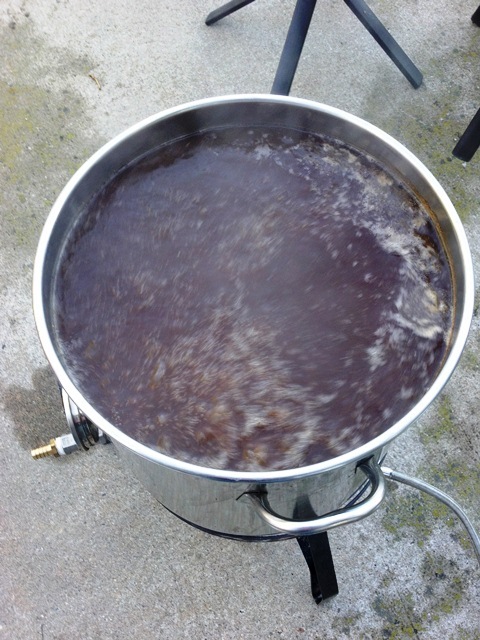 The boil went smooth. I added most of my hops at 10 minutes left. I will dry-hop with at least another ounce of hops in a few days. I cooled to around 70, then racked into the fermentor and let that sit in an ice bath to cool to 60F. That is where I pitched the US05. While I was brewing, Connor was playing WII. I don't know if you can see in the picture above, but on one of his bowling games, he got 9 strikes in a row, and ended with a 277 score. 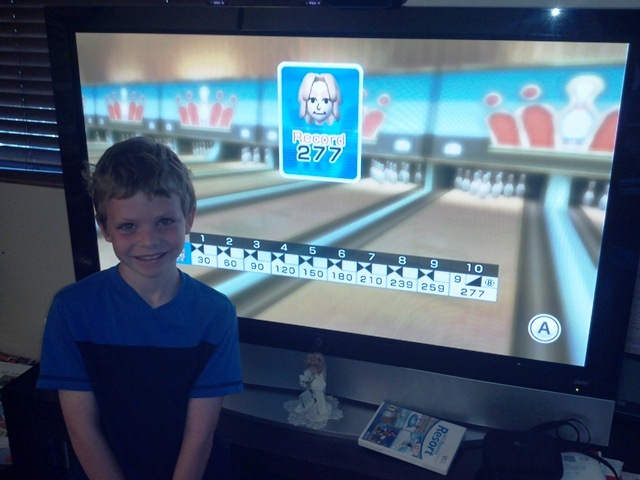 Until today, I was the wii bowling champion at our house. Connor completely buried my high score and now he is the undisputed champion. I was finished brewing before noon and had everything all cleaned up before 1pm. Early starts are sure nice. It seems like a really long time since I have made and IPA-like beer, so I really looking forward to having Eric the Awful Red Ale on tap. I cannot wait.